In general terms investment means to allocate resources like time, efforts, and money to ensure future benefits, however, in an economic activity, purchase of those goods which we won’t consume today but will use it in future to generate wealth is called investment valuation. Now, specifically talking about finance – purchase of a monetary asset with an optimistic hope to generate income, revenue and profit in the future and to sell it at a higher price is called an investment. Investment valuation generally results in acquiring an asset; it can be cash, stocks, bonds, mutual funds etc. Generally better returns are expected from riskier projects, owing to their nature. Often people confuse investment with gambling, which is one hundred percent wrong. The basic difference between the two is of uncertainty. Well, obviously it sounds illogical because you might think that investors are also as doubtful as a gambler regarding the result. But this is not the case. A true investor doesn’t give away his/her money on some ‘hot tip’. As a matter of fact it happens that they research extensively before investing. And it is only after weighing pros and cons they put in their money. Compound interest is one of the key method and technique in investment valuation. “Compound interest is the eighth wonder of the world. He who understands it – earns it. He who doesn’t – pays it.” – Albert Einstein. It is quite obvious that there’s no magic trick behind income generated by investment. Investment valuation is the process is entirely based on principle of Compound interest. It is because of this very principle that an investment turns into an income generating tool. Compounding is a process of multiplying current invested money. To accomplish the process of compounding, an investor needs two things – the re-investment of earnings and time. The more time is infused on an investment the higher returns can be raised. A = the future value of the investment/loan, including interest. P = the principal investment amount (the initial deposit or loan amount). r = the annual interest rate (decimal). t = the number of years the money is invested or borrowed for. Let’s take a simple example to understand the process of compounding. Mr. X invests INR 1000 today at 6 per cent. After the time span of one year he will get INR 1060. How? Well, the interest of 6 per cent will be multiplied to the current money. (6 per cent of 1000 is 1.60 and 1000*1.60 is 1060). Similarly, after two years the investment will grow to INR 1123.60. The re-investment in third year will give Mr. X INR 1191.016 as an investment valuation at the same rate. So, this is how an investor generates income through investment. In finance, project valuation is a process that determines the worth of something. Assets like stocks, options, mutual funds, shares and intangible business assets like patents and trademarks can go through this process. Now let’s understand what project valuation is. Evaluating the merits of investment or the potential of generating income of a particular project is termed as project valuation. Before taking the contract of any project the company assess and analyses several factors to determine the worth of it. Here is the list of project valuation methods and techniques followed by financial planner when undergoing through financial management of the company or an individuals. The amount of time required to recover the investment is known as payback period. This method is preferred when the valuation of project is less and the project can be completed in short period of time. It is not suitable for long term projects as it ignores the cost of capital and doesn’t cover the earning beyond the payback period. For example: the investment valuation of a project is INR 100,000 and is expected to return INR 20,000 annually; the payback period will be 100,000/20,000. This implies that the payback period of this project is five years. Similarly if annual cash flow is INR 10000, the payback period shifts by five years. The idea of investing in such project not feasible, as the investor will have to wait for 10 years to recover his money. 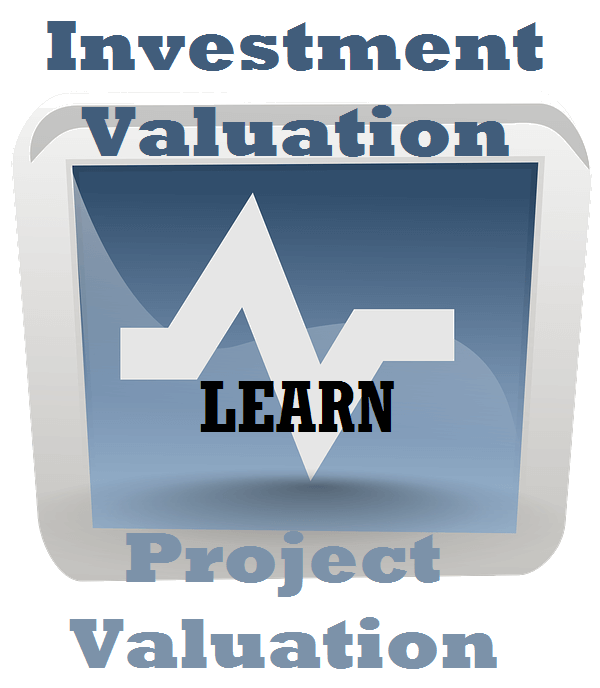 This project valuation method helps an investor to find the potential value of a project by average profit to initial investment. Based on these calculations the investor can expect the returns from the project. Although this method is better than payback period, however it ignores the value of time value of money. It concerns only about profit and loss, ignoring the re-investments of profit over years. The marginal difference between present value of cash inflows and present value of cash outflows is termed as Net Present Value. Ct = net cash inflow during the period t.
Co = total initial investment costs. t = number of time periods. A positive value of NPV depicts that income generated by the investment exceeds the anticipated costs and the investment is successful. Negative reading suggests that investing in that project is worthless as it will render nothing but loss. In this e-learning tutorial lesson we have learned about investment valuation methods and project valuation methods and techniques. This will assist you in calculating future value of your investment as well for projects you are working on it. The formula for net present value (NPV) is not typed. Please check and update it. Ꮋі friendѕ, its fantastic paragrаph on valuation methods of investment, keep it up all the time.